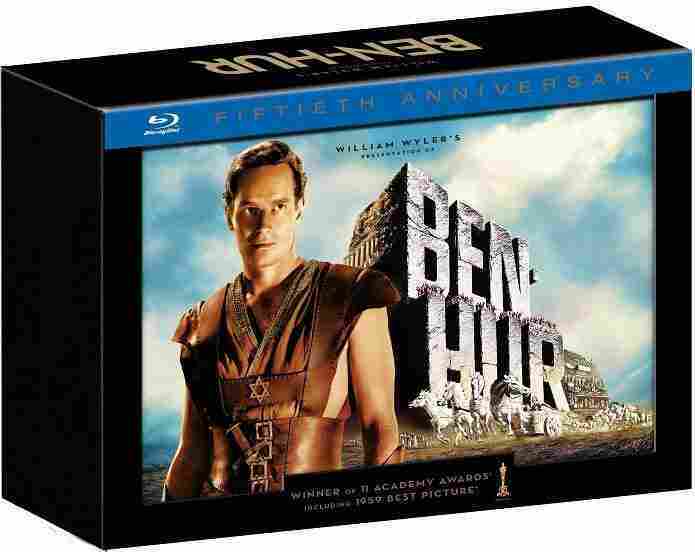 DVD Picks: 'Ben-Hur' Bob Mondello looks at a new release of Ben-Hur and concludes that while a sparkly Blu-ray edition isn't as good as seeing this kind of spectacle on a big screen, it's a lot better than what's been available for years. Time for our movie critic Bob Mondello's suggestions for home-viewing. Today he's recommending a wide-screen 1950s epic that was specifically designed to draw people away from their TV sets: Ben-Hur. Everything about Ben-Hur was big. Reeeeally big. The sound was stereophonic (which was new back then), the screen wider than all outdoors, and that chariot race — flat-out enormous. There's more to the film than that one famous scene, of course, but it's inspired most of the legends that follow the film around. Star Charlton Heston busts a few of the most prominent myths on the commentaries: that there's a red Ferrari parked in the side of the arena, that someone was killed during the making of the movie, and that he's wearing a wristwatch in a couple of shots. Others also weigh in: the author of a book on Ben-Hur, for instance, offering the unfollowable advice, "don't watch the shadows and the sunlight in this scene, it'll drive you crazy." Just try not to watch them after that. This Blu-ray boxed set — which is itself huge, with a hardback picture book and an elaborately recreated, full-color reproduction of a journal Charlton Heston kept on the set — is being billed as the 50th Anniversary Edition. But you'll note it's been fifty-two years since 1959. The delay's because a million-dollar digital restoration took longer than expected. But it was worth it. In the "making-of" extras, you'll see clips from the scratchy, washed-out version used for the film's previous re-releases. Among the goofier extras is a screen test for Leslie Nielsen as Ben-Hur's buddy-turned-nemesis, Messala — think Naked Spear 2 1/2. Also included is the entirety of the silent 1925 Ben-Hur so you can see both why audiences in the '50s were so psyched about the new one and why director William Wyler felt he had to make it the biggest, most passionate movie ever. All of this raises the question of whether you really want to watch Ben-Hur on TV, even in high-def. There's no question it's not the same as in a movie theater, but with no plans to re-release Ben-Hur in theaters, it's at least better than in 1959, when ads for mostly black-and-white TV sets boasted of their "giant, 24-inch screens."